Mandy Robek commits to two weeks of focused daily writing, and then translates what she learns about what writers need to classroom practice. 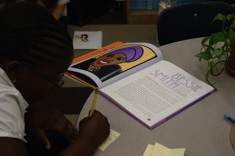 Mandy Robek finds quick poetry read-alouds are a great way to transition between activities in her second-grade classroom and build a love of poems. Mandy Robek finds kindergartner Mikey is lost in knowing how to use his time well during reading workshop. Her conference moves him from deflated to inspired. Mandy Robek leads a shared writing session in kindergarten. Mandy Robek helps her kindergarten students complete science observations. Mandy Robek shares her favorite texts for building understanding early in the year of writing workshop with young writers. These books are ideal for launching discussions about how writers find ideas. 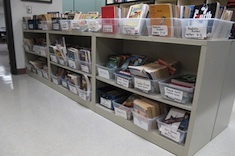 Mandy Robek shares her favorite texts to use early in the year with young students to introduce them to everything from places to read to how to handle books. Mandy Robek has a book choice conference with Drew. This is the first installment in her kindergarten conferring series. Mandy Robek introduces a new word to her kindergartners for their word wall. 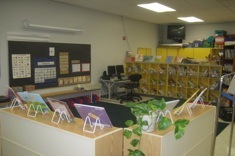 In kindergarten, table groups are a natural and informal way to help groups of students learn new skills through eavesdropping. In this short video from Mandy Robek's kindergarten class, Mandy targets the same skill of defining syllables during individual conferences at the table so that the learning is reinforced for all. It’s never too early to help students learn to make wise choices for independent reading. 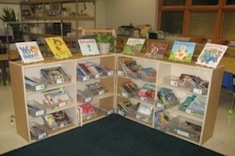 Mandy Robek reviews the I-Pick strategy for choosing appropriate books with her kindergarten students. Mandy Robek “warms up” her kindergartners brains for literacy work with a simple one-minute alphabet activity. Mandy Robek leads her kindergartners in a shared reading and performance of the classic tale Goldilocks and the Three Bears. Mandy Robek takes her kindergartners through a picture walk using Mrs. Wishy Washy as the text. Not content to use assessments designed for older students, Mandy Robek combines interactive writing and formative assessments in her kindergarten classroom. Mandy Robek shares five tips that can help teachers at any grade level develop strategies for tackling the Common Core. 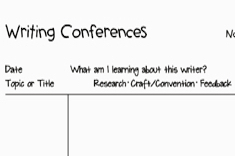 Mandy Robek shares how she has revised the records she keeps during writing conferences. Mandy Robek finds she needs fewer reading groups and more conferring with the emergent readers in her kindergarten class. 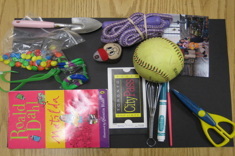 She shares how she structures her brief time with students and a conferring form. Mandy Robek gives us the how-to as she revises a community-building project to make it a better fit for Kindergarten students. 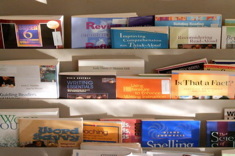 Mandy Robek has a delightful list of books that help students reflect upon and monitor their behavior in the classroom. Teachers of young learners face special challenges in honoring Martin Luther King and dealing with the violent nature of his death at the same time. Mandy Robek offers some insights into how to celebrate King's life with even the youngest students. Mandy Robek finds a punctuation unit study with her third graders is a fun alternative to yet another genre study. 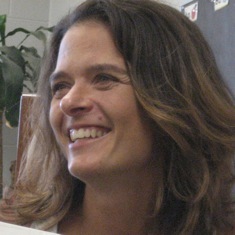 Her essay includes booklists of children's literature and professional texts. 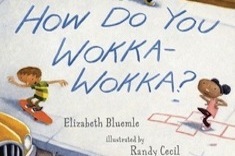 Mandy Robek shares some of her favorite children’s books for teaching economics. What's the value of reading at home? Mandy Robek ponders the home/school connection. 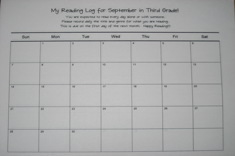 Readers enjoyed Mandy Robek's explanation of her move to home reading logs in a calendar format, and some wrote in with additional questions about the program. Mandy provides a follow-up article in a question and answer format, addressing issues raised by readers. "School is not summer camp" – this quote reminds Mandy Robek that there are many challenges to building a strong classroom community in the midst of demands for achievement and accountability early in the year. 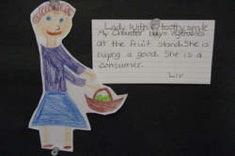 Her "literacy jackdaw" project is a terrific vehicle for classmates to learn about each other, and hone their listening, speaking, and writing skills in the process. Mandy Robek explains with a video example how “interruptions” from students can deepen the shared reading experience. In this case, her kindergarten class is exploring punctuation. The words prompting and support appear often in the kindergarten Common Core State Standards. Mandy Robek analyzes what prompting and support looks and sounds like in her kindergarten classroom by using a video example.